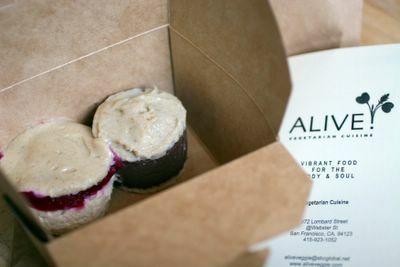 Alive, creators of vibrant food for the body and the soul, were doing a promotion outside the Far West Fungi in the San Francisco Ferry Building on Saturday. They were selling samples of their food including some desserts made from Candy Cap mushrooms. I was curious and they sounded delicious as well as intriguing, so I bought two at $5 each. I took mine home. Things were hotting up at the Ferry Building and I had an inkling they would taste better chilled. I firmed them up in the freezer for about half an hour. Both of these desserts were vegan and 'raw', made with nuts, cacao and fruit. Both had a candycap mushroom topping too. They explained this was just for the tie in with Far West Fungi promotion, their desserts don't ordinarily contain mushrooms. 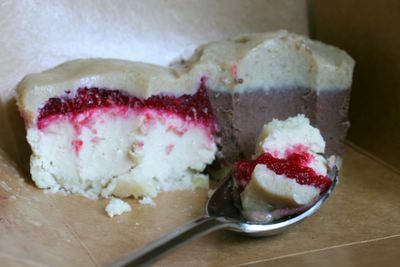 When you eat either of these 'cheesecake'/tortes, you just cannot possibly believe they are either vegan or raw. They were both so totally delicious and different from each other I couldn't decide which one I preferred. The raw cacao had such a dense chocolate depth to it. The raspberry had a nice tart zing. I think they went pretty well with each other - maybe a chocolate raspberry should be Alive's next combination. I am not sure I am ready for another full-on raw restaurant experience so soon after Cafe Gratitude. But I'll be working fairly close by to their restaurant in a couple of months from now, at which point I'll be sure to pay them a lunchtime visit. (Their lunch prices are cheaper than dinner.) If the delicious desserts I tried on Saturday are anything to go by, the experience will be something to look forward to. They sound so good sam.I would love to try these. I still haven't found a 'raw' restaurant in Australia, I might have to do some digging. If I did it would have to be good like this though! So that's what was going on at that table at the Ferry Building... My meter had expired and I couldn't even see past the throngs of congregating people as I rushed by the area, but my curiosity was certainly piqued. Sounds delicious -- I'll definitely have to check Alive out. You can put that on the list of 'must visit' when I next come to see you. They sound so delicious. You know, I had some Candy Cap ice cream from the Ferry Building mushroom people at the Slow Food event several months ago. It was really good, very evocative of maple syrup. I have eaten once at Alive! and don't worry-it is quite the opposite of Cafe Gratitude, it is a much more serious; far less intrusive experience. The food is less nutty and dense as well from what I could tell. Some of the dishes seem a little odd flavored, but that may be an Asian thing. I would definitely go again, but I am raw and restaurants like Alive! and Cafe Gratitude are the only places where I can really eat. I have the appetizer, entree, dessert and drink and feel like I have gone to heaven.